A personalized 3.25 x 3 heart shaped wedding save the date magnet spills LOVE in bold letters and gains easy acceptance from all those who receive it as a pre-invitation. A custom 3.25 x 3 heart shaped wedding save the date magnet can easily gel with the Valentine wedding theme or any other creative wedding theme that crosses your mind. This magnet will be easily accepted by everyone due to its very loving and affable shape and it feature over refrigerator doors of your family and friends as a testament of your love. 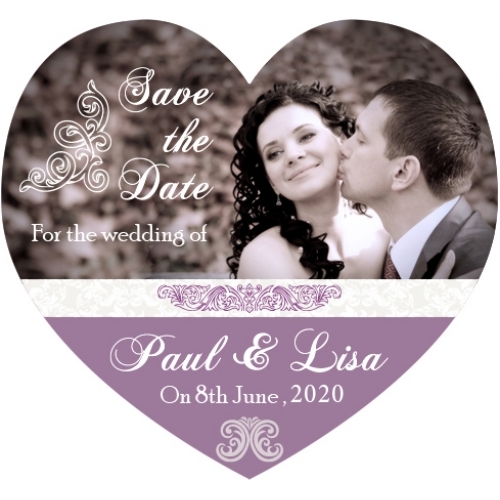 A heart shaped wedding save the date magnet is always a best choice to say that you are entering into most meaningful phase of your relationship. Product Size : 3.25 in. x 3 in.